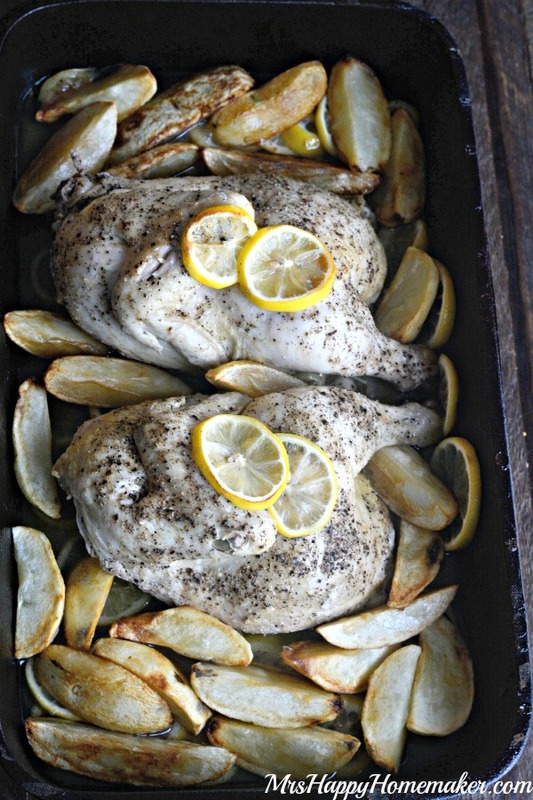 Greek Restaurant Style Lemon Garlic Chicken – my best friend learned how to make this delicious & easy dish in a family Greek restaurant some 20 years ago & it’s SO good! It’s all about the method here!! I have recently found a new dish I love thanks to a friend of mine. 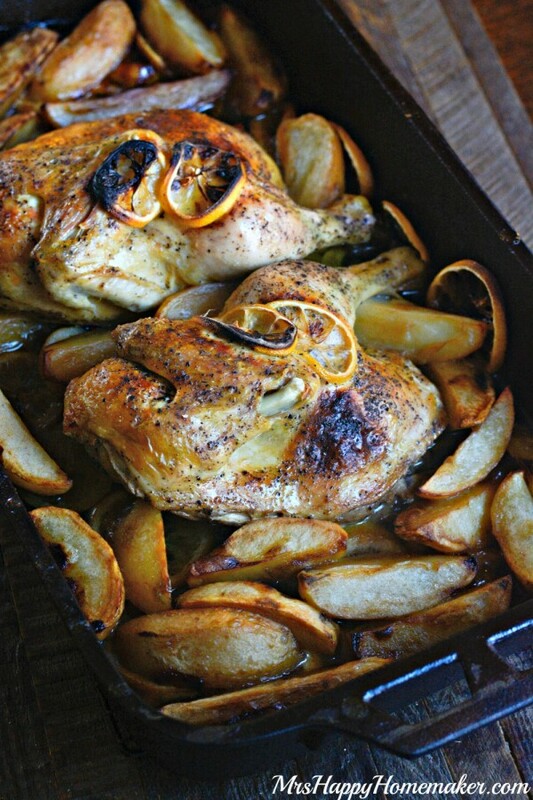 He used to work in an family owned Greek restaurant about 20 years ago where he learned to make this fabulous recipe for Lemon Garlic Chicken & Potatoes. It’s literally one of the best things I’ve ever eaten – it’s so, so good. 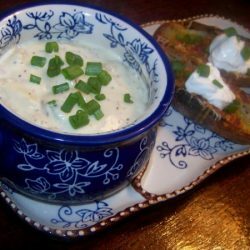 After I got the recipe, I looked online for others and while there are those that are a little similar, this recipe is different than all the others. The biggest difference in this is the method that it’s done. Any good cook knows that the method is just as important as the ingredients that go in it. 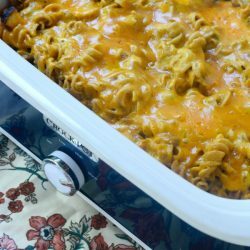 This method (plus the ingredients!) are right on point. Each time I eat this – once my plate is empty & my stomach is totally full & can’t handle even one more bite… I head to the pan to make myself sick to eat even more. It’s not complicated at all to make either. In a large roaster pan, add about 6 cloves of garlic that’s been sliced into the bottom. Squeeze in the juice from one large lemon & give it all a good seasoning of salt & pepper. In the below picture, there’s a little bit of sliced onion – that’s not necessary… I just had it leftover & it needed to be used. 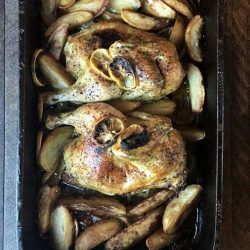 Take a large roaster chicken that’s at room temperature (anywhere from 4 to 6 pounds) & slice the whole chicken in half completely (between the breasts). Each chicken half will have a breast, thigh, leg & wing. Lay it cut side down (skin side up) over the garlic & seasoning. Season with salt & pepper. Slice your lemons into 1/4″ thick slices & lay around the rim of the pan. I had a large pan, so I used about 3 lemons but you may use a little less if your pan isn’t as big. You just need enough to go around the outside of the pan; like so. Drizzle in enough vegetable oil or olive oil to cover the bottom of the pan anywhere from 1/4 cup to 1/2 cup – depending on the size of your baking pan. When I use my 7 quart roasting pan, I use just about 1/4 cup of oil in the bottom. When I use my huge (and I do mean HUGE!) cast iron, I use more like 1/2 cup. 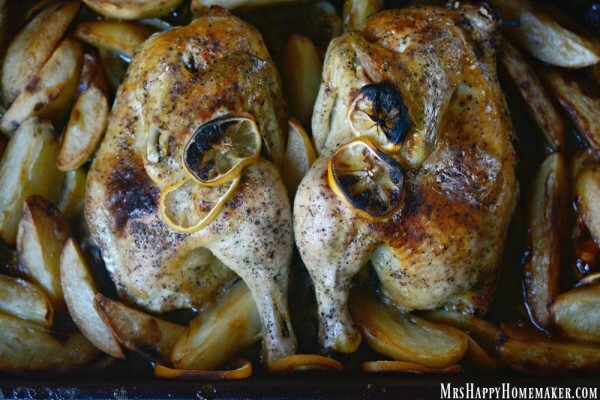 You can find the cast iron roasting pan that I use in the pictures here on Amazon. Cover tightly with aluminum foil. 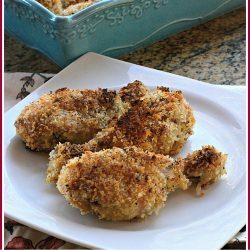 Bake at 425 – 60 minutes for a 4 pound bird, 75 for 5 pound bird, & 90 minutes for a 6 pound bird. While the chicken is cooking, slice 5 or 6 potatoes into long wedges. Heat some vegetable oil on medium high & fry the potatoes for a few minutes per batch, just until brown. You’re not wanting to cook the potatoes all the way here – you just want to put them brown on them. And yes, par-frying them does make a huge difference in the final outcome! 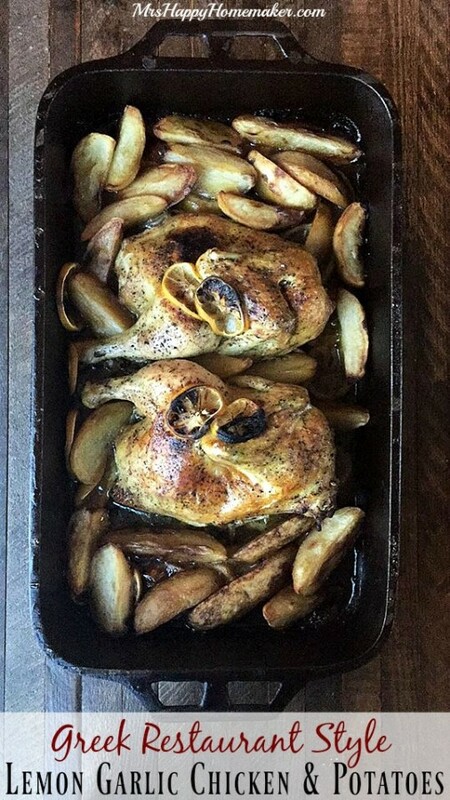 Once the chicken has cooked for the full 60-90 minutes (depending which sized bird you used) – arrange the potatoes around the chicken. Recover the pan with aluminum foil. Bake for additional 30 minutes. Remove the foil & broil for a couple minutes to put a brown on the chicken. Add this one to your ‘must-make’ list – it’s out of this world!! 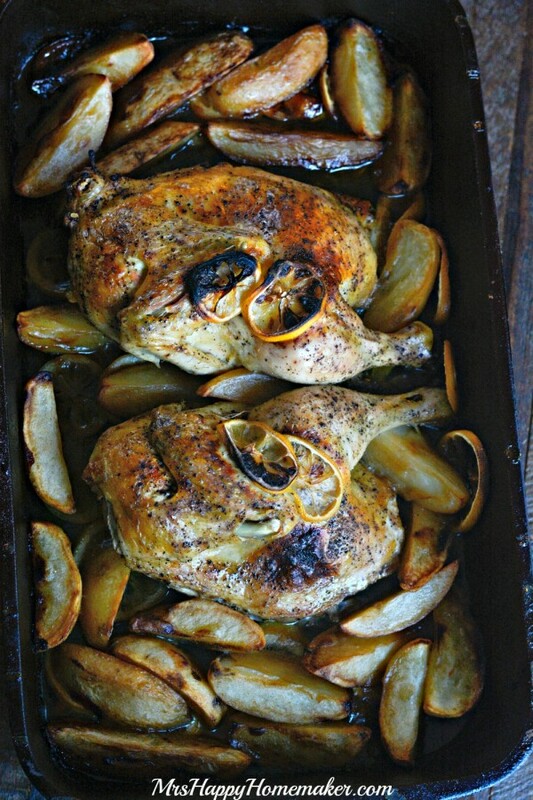 If you like the big cast iron roaster I used in this recipe, you can find it here. My best friend learned how to make this delicious & easy dish in a family Greek restaurant some 20 years ago & it’s SO good! It’s all about the method here!! 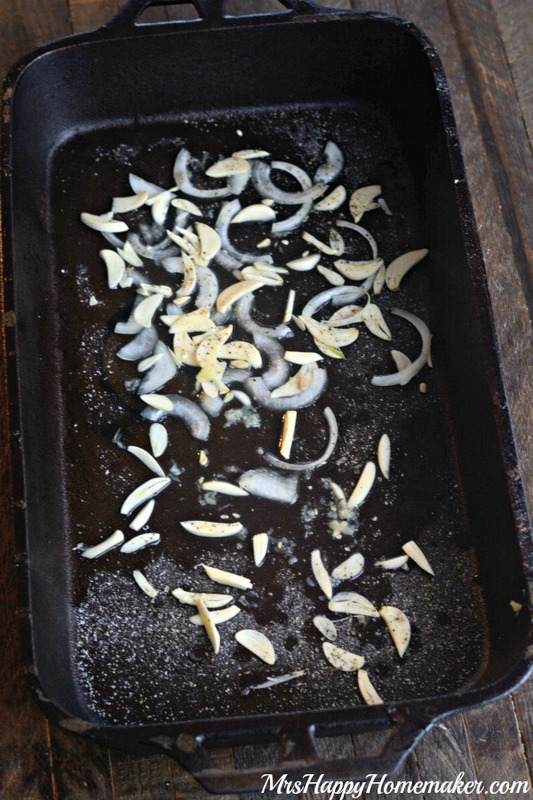 In the bottom of a large baking pan, sprinkle the sliced garlic. Squeeze on the juice from one lemon & season the entire bottom of the pan with a good bit of salt & pepper. 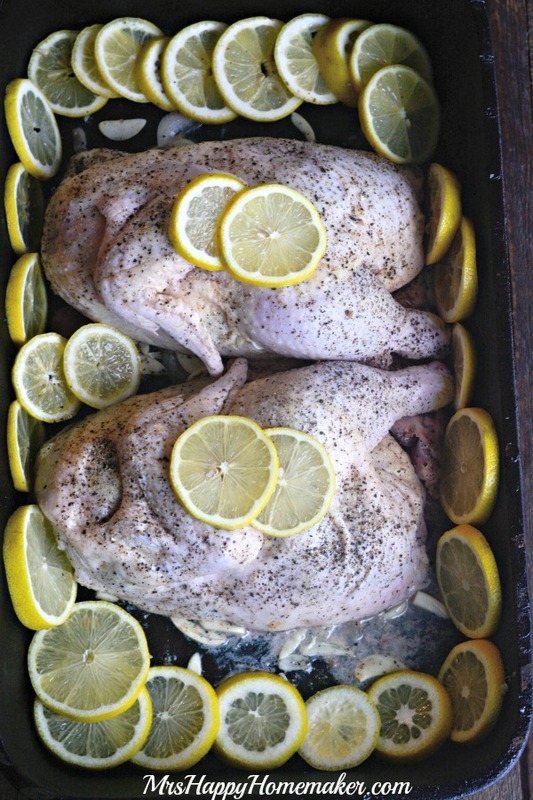 Lay both halves of the whole chicken side by side in the middle of the baking pan, cut side down/skin side up. Season with salt & pepper. Arrange the lemon slices around the edge of the entirety of the pan. Drizzle in enough vegetable oil or olive oil to cover the bottom of the pan. Place the butter in dollops/slices all around the pan. Cover tightly with aluminum foil. For a 4 pound bird, cook for 60 minutes. For a 5 pound, cook for 75 minutes. For a 6 pound bird, cook for 90 minutes. While the chicken is cooking, par-fry the potato spears in hot vegetable oil. 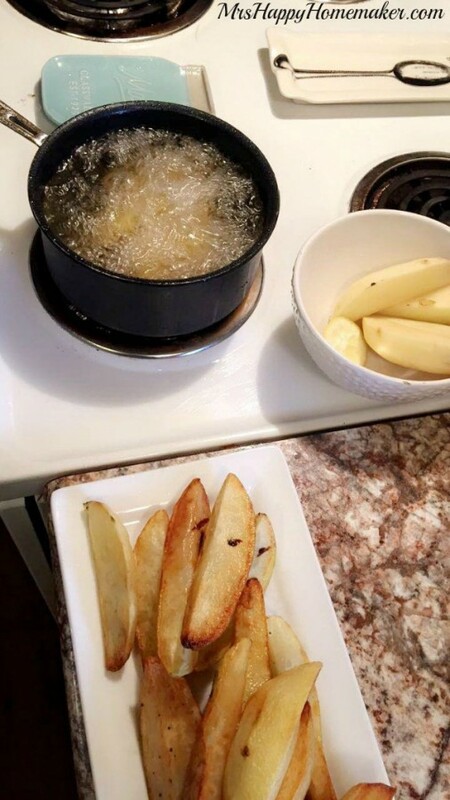 Fry for a few minutes for each batch, just enough to put a light golden brown on the potatoes. 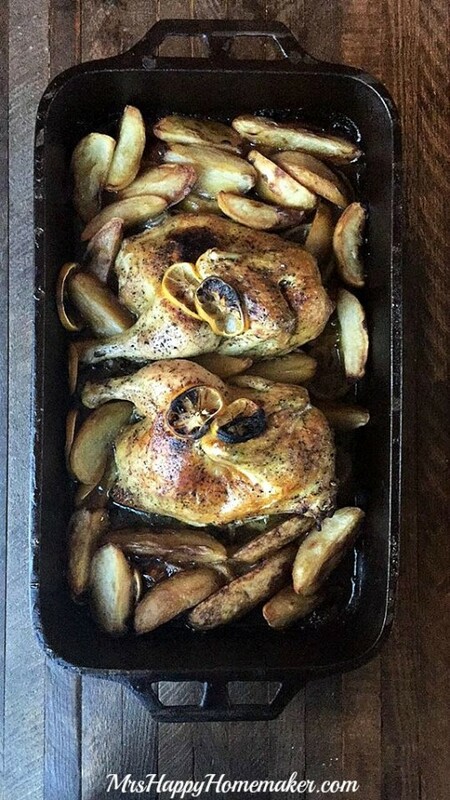 Once the time is up on the chicken, add the potato spears all around the chicken. Recover with aluminum foil and bake for another 30 minutes. Remove the foil & broil for a few minutes to put a brown on the chicken.